Las Vegas, 1941. Stretching before you is Highway 91, soon to be known as the Las Vegas Strip. In this desert landscape you see the future home of the most fabulous hotels and casinos in the world. 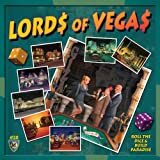 Over the next few decades, you and your fellow developers will build the Las Vegas Strip from the ground up, vying to become the new Lords of Vegas. You and your opponents represent powerful developers in a burgeoning Nevada city. You will earn money and prestige by building the biggest and most profitable casinos on "The Strip", the town's backbone of dust and sin. You start with nothing but parking lots and dreams, but from there you build, sprawl, reorganize and gamble your way to victory. Score the most points investing in the most profitable development companies and putting the best bosses in control of the richest casinos. Put your dollars on the line . . . it's time to roll! The game board is broken into 8 different areas, each consisting of a number of empty 'lots'. Players build lots by paying money and placing a die of the value matching the one shown on the lot's space onto the lot, along with a casino tile of one of 7 colors. Adjoining lots of the same color are considered a single casino. The casino's boss is the player whose die value is higher than any other in the casino. On each players turn, players turn over a new card representing a new lot they get. The card also is one of the casino colors. Any built casinos of the matching color will score both money and VP. Money is earned for each lot in the casino, where each lot may be owned by a different player. VP goes only to the casino's owner. 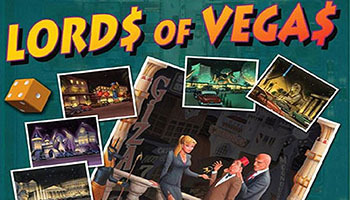 Players can expand their casinos; try to take over casinos owned by other players; make deals to trade lots, casinos and money; or gamble in opponents' casinos to make more money. Ultimately, though, only victory points matter, and that means making yourself boss of the biggest casinos. 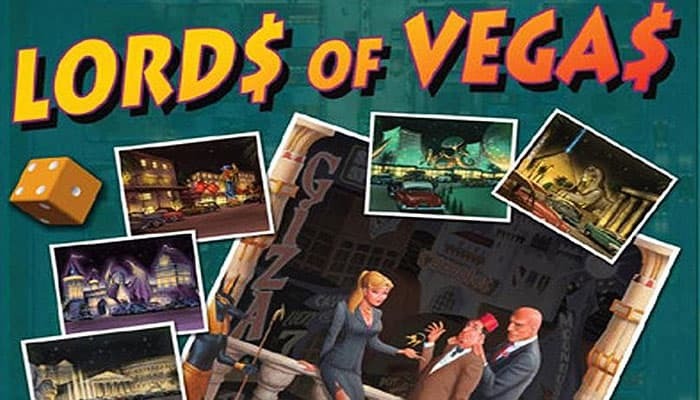 In Lords of Vegas, you are a Las Vegas developer and casino boss. You build casinos, trade properties, gamble in other players' casinos, and improve the casinos you manage. You are paid points and money for controlling the best casinos and in the end, the player with the most points wins.